Jubb and Cois committed to protecting and processing your personal data in accordance with the General Data Protection Regulations and the Data Protection Act 2018 (the legislation). For the purpose of the legislation and your personal data, Jubb and Co, is the Data Controller, Caroline Jubbis the person responsible for data protection and can be contacted at Jubb and co, 6-8 Old Mill Lane, Barnsley, South Yorkshire, S70 2LA, 01226 730999. The personal data we process may include the information in column A of the attached appendix and may also include other sensitive data concerning health if applicable to the tenancy. Where the provision of data is a statutory, a contractual requirement or a requirement necessary to enter into a contract, a refusal to provide the data may mean that a tenancy cannot proceed. Where we state that we have a legitimate interest, the fact that we have a legitimate interest and what that legitimate interest is, will be stated in column E, e.g. to fulfil our legal and contractual duties; to keep our records up to date; to serve legal notices and paperwork. Your personal data will beprocessed during and after the tenancy and any subsequent tenancy, where you are named as a permitted occupier. We will retain some elements of your personal data for up to the time defined in column H after the end of the tenancy. The information which can be anonymized will be that which is no longer required for either contractual fulfilment or a legitimate interest. If the lawful basis for processing your data was consent then you may withdraw such consent at any time. 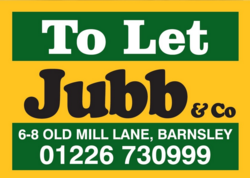 Where the lawful basis for processing is your consent, you may withdraw consent at any time by writing to, Caroline Jubb, Jubb and Co at 6-8 Old Mill Lane, Barnsley, South Yorkshire, S70 2LA or emailing caroline@jubb-co.com.